This is a fast, yet incredibly delicious recipe. 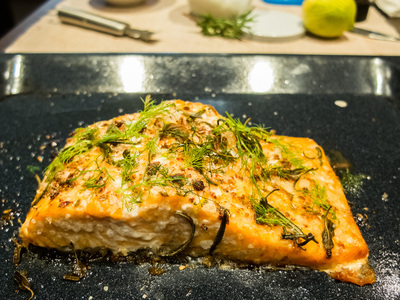 All you need to do is to buy a nice piece of fresh salmon fillet, season it with herbs and spices and let the oven do the rest. Since salmon is a fish of very tasty meat, soft and full of flavor, it takes little to enhance it to the fullest and obtain an exquisite dish. 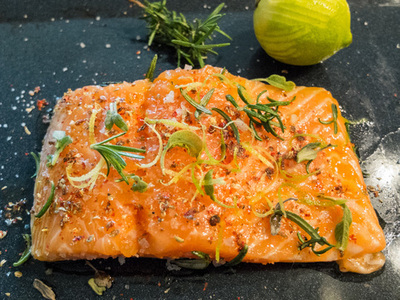 Place the salmon fillet in an ovenproof dish, skin part facing down. Crush the pink peppercorns and coriander in a mortar. Season the fish with salt and sprinkle it with the crushed spices mix. Then add a few sage leaves, 2 or 3 sprigs of rosemary and zest of half a lemon. Drizzle with a little olive oil and bake at 180 degrees for 20 minutes. Cut the cabbage and a half of fennel into thin slices. Wash and chop the salad, then mix it with the cabbage and season with salt. Prepare the dressing by mixing the mustard in a bowl with apple cider vinegar, honey and oil. Here, the doses are approximate, depending on tastes. Just let your palate guide you and find that perfect balance between the sour notes of vinegar, the pungency of the mustard and the sweetness of honey. The pungent, sour note given by the vinegar and mustard helps lighten the salmon.